Co-published with Inside Higher Ed. This series of essays written for trustees and administrative leaders of universities and colleges draws on the authors’ extensive consulting experience, research into the dynamics of boards, and service as trustees, to focus on practical insights that will help readers improve governance. The authors have contributed a series of essays on governing well to Inside Higher Education, which formed the inspiration for this volume. "The work of the Board and the chief executive officer has never been more critical in higher education than it is today. As we face this unparalleled disruption, we are all searching for the right "hands-on" tools that can moor us in times of challenge, point us in the right direction, and add wind to our sails as we reposition. This book rightly assumes that the success of institutions will be most determined by the Board's ability to govern effectively. This is not an esoteric work where you have to be an insider to understand its recommendations; rather, it is a practical guide to how we should be thinking about governance with ready made tools that can be used almost immediately. It should be required reading for all boards of trustees and executives at colleges and universities." "As colleges and universities face increased scrutiny and mounting pressures, effective board governance has moved from a luxury to a necessity; if our institutions are to succeed in this environment, they need effective leadership from their Boards. Few are equipped to provide it. What a gift to have the wisdom of two distinguished leaders at our disposal during this critical time for higher education. Their extensive experience working with presidents and boards is displayed on every page of this book. Observations and suggestions are organized into clear and accessible essays that will prove equally valuable for public and private boards, presidents, and leaders. During a time of tumult and change, the wise counsel of Practical Wisdom serves as an essential guide to effective governance." 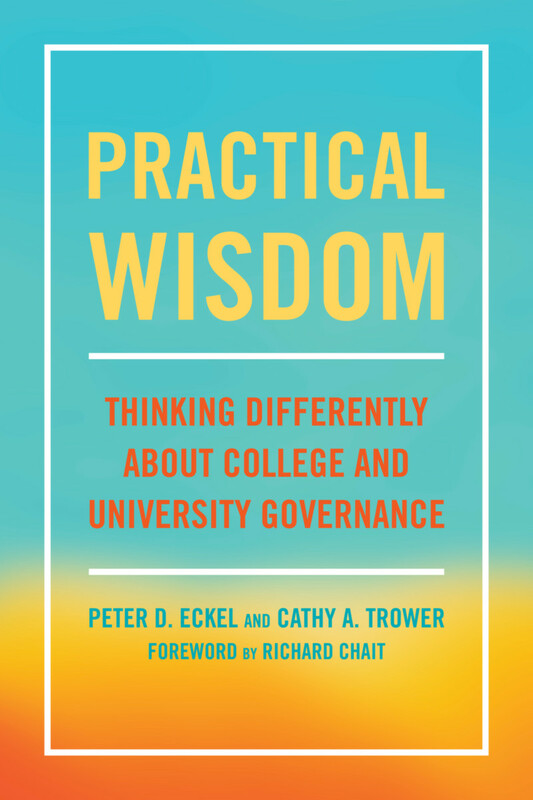 "Practical Wisdom embraces the intricacies of university board governance by providing thoughtful insights into the multiple issues that contribute to its complexity. Treating governance as a learning process and drawing from personal experiences working with public and private institutions, Eckel and Trower challenge trustees and administrators to think more intentionally about the work of the board, while providing well-informed and astute practical guidance for powerful learning to drive higher performance." 3)	Is Your Board Mediocre? Peter D. Eckel is senior fellow and director of leadership programs in he Alliance for Higher Education for Democracy in the University of Pennsylvania's Graduate School of Education. He coleads the Penn Project on University Governance and serves as a trustee at the University of La Verne. Cathy A. Trower is president of Trower & Trower, Inc., a board governance consulting firm, and former research director at the Harvard Graduate School of Education.